Chingford in Essex remained a rather isolated settlement until the 1870s, when it was finally connected to London by railway. This attracted tourists to the area, as well as encouraging the building of new houses for workers in the city. Previously a royal estate, Epping Forest was opened to the public by Queen Victoria in 1882. 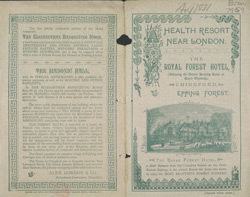 The Royal Forest Hotel was situated on top of a hill near both the forest and the train station. It opened in 1890 and boasted private sitting and coffee rooms and even a grand banqueting hall. The hotel is still in business.